Throughout this book marketing series, I will have a few guest posts from authors and editors who have shown true promise in the topics they write about. My hope is that by bringing in guests with experience and knowledge, you’ll get an in-depth walkthrough of what to do and why, and the details will allow you to be effective in your journey as you market and sell your book. In previous posts, guests talked about personal experiences with book cover reveals and giveaways, as well as hosting book releases. When your book is released, though, you need to keep sales up. There are many ways to do that, some you can start on before your book is released. Here are a few dos and don’ts to get you started, and you can always adapt these to fit your needs and add on to them later. When you’re hosting a book cover event, you want your visitors to feel welcome and excited. Keep the following in mind before, during, and after the event, as well as throughout your writing career. Invite everyone who you think will come. Don’t leave someone out because they might not come. Leave them out because they won’t or they asked to be. If you happen to bump into someone at the store or start a conversation with someone at a cash register, don’t be shy. Believe it or not, you’re exotic. People love to know they met an author, so to say you’re releasing a book soon is to tell a stranger you’re taking the plunge. You’re taking the world head on. You’re trying to do something with your gift. And they might want to be part of it. If you tell them you’re releasing a book or revealing your cover, some will be thrilled, and if your fifteen-word pitch (or close to that) intrigues them, you might want to be able to toss them a paper with the link or send it through your phone. That’s another person right there, and many times it’s a promising one! How many people who say that do you think actually remember to check it out? A business card doesn’t automatically mean a sale, but cards aren’t expensive, and they’ll help more than hurt. You don’t have to buy them, either. If you don’t have the funds to purchase professionally made cards, simply purchase cardstock and design them yourself, If you look up business card designs, you can get an idea of how they look, what size to make them, and then you can create something simple to use until you can get your own. They’re especially handy at book events, and if you have any giveaways, sticking a business card in there will give people an opportunity to look at your other social platforms and published books. Talk to local bookstores, newspapers, magazines, etc. Don’t wait for your audience to come to you. Get yourself out there. Newspapers and bookstores have your audience, as do some magazines. Prepare a press release, talk to small bookstores, and make sure they know you’re local. Nothing is better than a local success. Sure, you might not be famous yet, but you might be, and a local success on any level is worth showing off. Let them do it. But they have to know you’re there. Blogs have audiences, too, but these places will likely want a free book. Prepare to give them one. They’re giving you a review and exposure. A free book won’t hurt you. If you can give them an e-book, that’s one better. You don’t spend a dime. Reedsy sent me a link to a fancy little spot where you can look for paid and free promotion services. You can even organize the list by tier (credibility), cost, genre, traffic size, and more! You can get to that here. All the same, free books mean reviews, which mean credibility, which mean more sales. Having fifty reviews or more is healthy for a book, so make that your goal. It doesn’t mean you need to give out fifty free books. Remember, though . . . e-books are free gifts. Whether it’s a physical book signing or an online book release/cover reveal, prepare ahead of time. Prepare posts, prepare gifts, gather merchandise, and figure out what you’re going to do, wear, and say. Think about what your audience will be like and plan for it. If you’re a pantser writer, don’t be a panster event host/attendee. People want to see a professional or they want to see someone who has something they want. Be what they need and be ready. Don’t show up empty handed. This means you should create a Goodreads account, create an Authors’ Central account on Amazon, start a Twitter, a website, Facebook page, e-mail list, and whatever you’re able to start to get your name out there. Your audience is everywhere. Be everywhere you can. This could go in the above label, but a website is its own “little” thing. A website is like a one-stop place for all your information—blog, writing events, readings, upcoming interviews/events, published books, upcoming books, works in progress, media information, etc. You want to have everything available here. Your website should be the root system that everything connects to, but it also branches out to bring your readers to your smaller, more niche-focused platforms. I know I slipped and had a few don’ts in the above sub-subheads, but that’s okay. Remember, these are things you should not do. So don’t do them. Asking someone for a good review is like telling your friend to tell someone you’re super attractive (if you wanted to go on a date). While the statement might not be wrong, it’s not honest, meaning you’re asking them to say something on a biased note. Besides, why would you want to mislead your readers? Let people say your book is good because it is, not because you want it to be. Reviews are sacred, and they are what make people buy things. Don’t mess with that and make reviews a dishonest marketing tool that loses value as a result of dishonesty. Nothing is worse than shutting down someone else’s work just to make yours look better. Your book must not be that great if it can’t stand on its own. If you disagree, don’t use a tactic that requires someone else’s book to look bad for yours to look good. Be creative. Showcase your book in a positive light. Damaging someone else’s work for your sake, and at the risk of damaging your reputation, isn’t worth it, and it’s just wrong. This is for the same reason as the above label. Why do this if your book is good? Let authors have their light. They deserve it. Don’t be petty, and don’t damage the credibility of the same review system you use to increase the hype of your book. In the end, a false review hurts you, too. And that’s not considering if you get caught. Have you seen some of the stories about people who get caught doing things like this? Don’t be that person. It is absolutely thrilling to see your book on a shirt or your book cover on a coffee mug. But, think about whether people will actually buy it before you fill an order and buy a bunch of merch. If you have a large fan base, this might be an awesome idea, but identify where the demand lies before buying things. Shirts and mugs are always a quick go-to, but pens, business cards, postcards, key chains, bookmarks, posters, and even signed copies are quicker to leave your supply than mugs and shirts. It might be different for you, but it’s easy to give away a keychain or sell a signed copy. It’s hard to sell a shirt. Keep in mind, this might be different depending on how successful you are, but consider your options. That’s the idea. You don’t have to spend a lot of money to make money. Yes, you will have to spend money, but don’t think you have to pay for marketing for everything you do and buy a bunch of merch so you have something to hand out. Something as simple as a quick conversation with a lady at the bookstore will be a more promising sale than handing a stranger a key chain with a link to your book. Why would a writer buy a writer’s book? That’s like trying to sell a roof to a roofing company. Your audience is not in a writing group, nor is it in an “Advertise your books here!” You know who you’ll find in an advertising group? People who want to advertise books. You know where you’ll find your audience? The library, book events, a book club, reading events, bookstores, grocery stores, your community, and beyond. Your audience will come to you when you make them see you. Make them see you first. Don’t try to find them in a place where everyone else is dumping their ads. 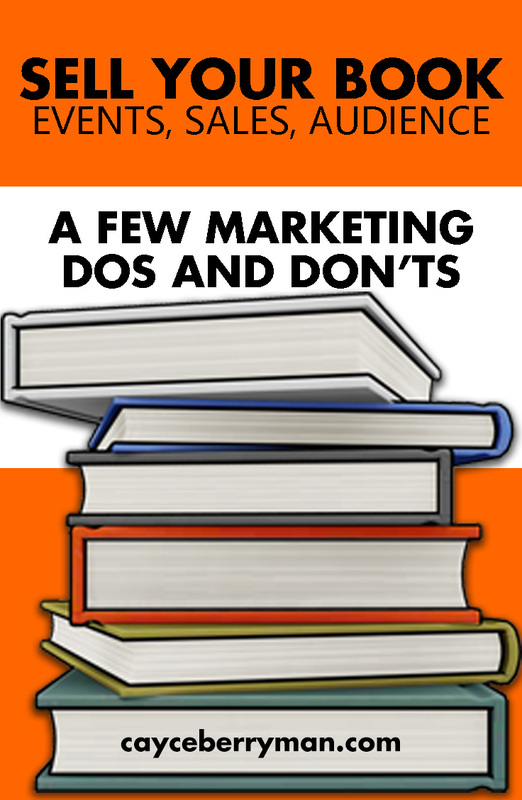 Things like marketing a book are something you’ll learn a lot about as you try. You’ll find an online ad that works, you’ll figure out a good day to offer free e-books, and you’ll figure out that spot in your social platform that allows you to communicate with your audience and be heard. These dos and don’ts aren’t here to knock your dreams into the dirt or tell you what to do. However, they’re good tips to help you start somewhere so that as you learn, you can find the right path for yourself. Write for yourself, but edit for your reader.